Players want their characters to be fun, which means they should serve as capable tools for interacting with the world and resolving challenges presented in the story. They should also be connected to the story through hooks to give them context and motivation. These two layers actually oppose one another. There’s a system in the World of Darkness games called Merits and Flaws. Merits are usually ways to make your character more powerful in a specific and focused sort of way. They’re no different from most other games’ lists of character powers or skills. Flaws are the interesting part because flaws give you more points to spend on Merits or other character traits, but in return you have to accept something negative about your character. As a GM, this mechanic is awesome. It gives players a chance to make a bad decision intentionally, and justify it to the other players. As discussed elsewhere, flaws make great hooks, but they also make great spotlight opportunities for players. Most importantly, the Flaws systems in both Old and especially New World of Darkness games (and in many other games and even house rules systems for games without Flaws) do something unique: They bridge the gap from hooks to capabilities. They make your character stronger (with points) while giving you some pretty gritty story hooks. The forces of capability and motivation are still opposed, but they're also united. A good player or even a half-decent one can use a Flaw to justify taking an action that is not expedient or even competent. Designing scenes to provide a real challenge in World of Darkness games is laughably difficult. It’s hardly worth even trying – You have to consider the die pools of each character, but also all of their supernatural powers, potential ways of getting die pool modifiers, and their ability to expend resources to raise their die pools. Combat challenges are even less predictable. But then, this ain’t D&D. In D&D, everyone can be 90% dead and the battle would be considered a success. A single character getting wounded is supposed to be a big deal. Instead of that sort of challenge, a World of Darkness GM should design his scenes to challenge the players’ flaws. Their flaws include the Flaws they got points for, their Nature and Demeanor or Virtue and Vice (which, unlike alignment, specifically reward irrational behavior), and their particular politics (supposing you’re running a game with political intrigue in it, as intended). Also, if you’re playing a game like Werewolf or Vampire, list their “don’t freak out and do evil stuff” stat (e.g. 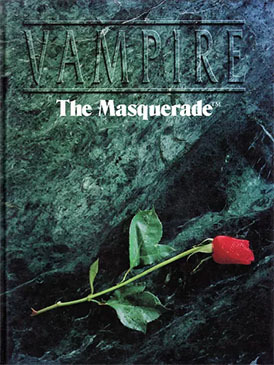 Courage/Self Control in Vampire: the Masquerade) and their Humanity, or equivalent stat if it’s especially low. Under Major Flaws, list anything where the character would be compelled or at least strongly motivated to act irrationally. Under Minor Flaws, list anything where the character would be motivated to act irrationally, or at least tempted. Here’s an example using the Vampire: the Requiem system. Try to work these things into each and every scene that you plan, if you can. In World of Darkness games, often you have to ad lib scenes, but you can plan a few scenes per night, and that means you can touch on a few flaws per night. With the new World of Darkness system, the reward for getting caught up in your flaws is an experience point, in addition to the spotlight time. That’s even better! The downside of granting additional build points for flaws is that it exacerbates the already widely variable results of point-buy character creation. Like you, I'm glad that the later ST systems removed the front-loaded benefit to flaws. Now there is a smaller issue that since many of the flaws don't have the mechanical nature of their penalties well outlined, some players now shy away from flaws. Perhaps that is why I'm very much in favor of the idea of flaws as a mandatory component for dramatic roleplaying games. I redesigned them for my Changeling game. I made them simpler: Anything can be listed as a Flaw. It only grants an XP in a session if it significantly impairs you during a session. You can put "mildly allergic to pop tarts" or "blind" on there, and that's fine but one of those is going to be an XP / spotlight time factory and the other is going to sit there unused. I also said you can earn 1 xp per flaw up to 3 per session (so 3 flaws became almost mandatory). I'd be concerned that your bonus XP for flaws might create some significant difference in character advancement. (I know, in a White Wolf game that's probably alarmist, but I prefer my players have the opportunity to afford some of the more interesting powers eventually.) To prevent this from happening I would probably inflate my session XP rewards and maybe cap flaw XP to once per session for any flaw. Then the benefit to having multiple flaws is that you have different means in which you can seek that flaw XP each session. Well I don't give ANY other kind of XP, but I gave them 100 starting XP. They didn't have to spend it all. At this risk of "um actually" I'd like to not that the Old Flaw/Merit system isn't much different from what existed in GURPs, Champions, and a lot of other games that predated the WoD. Similarly, lots of indie games and some very non-indie ones (like Deadlands) used something like the New WoD Flaw system. That said, I agree that flaws, particularly in systems similar to the New WoD, are very useful for the GM. The biggest problem I've had with them, as a GM, is when they don't move me in any way (oh, right, rats hate Bob) or when they don't move the player (either the player took it because (s)he wanted an advantage and/or got tired of it, so they have no passion for the sort of "trouble" that the flaw generates). Reinhart, certain types of players benefit from NOT taking flaws. If you're not enthusiastic about the sort of trouble a flaw engenders, you're better off not taking it. Being less mechanic-strict actually makes this *clearer*... I'm running a Reign game right now and all the players only took flaws they *love* having, or didn't take any at all.